It’s been over ten years. The campsite at Daan Viljoen Game Park near Windhoek has changed a lot since then. But this article is not a camping review. It is a report about our thirteen-day stay there. What we experienced at that time can still happen today on every campsite in Namibia. Have fun reading! In December 2006 we travelled to Namibia as we do every year. Since I had had pneumonia in November and had not fully recovered during our journey, the planned long trip to the Kalahari was not possible. We stayed with our family in Windhoek and considered other options. They were camping at the coast or camping on Kanona, a family farm. The length of the journeys to both destinations spoke against these possibilities. Should we stay in Windhoek? But four weeks of bothering the family? And furthermore, we wanted to experience nature! Since we didn’t spend our money on a trip, we invested it in camping equipment. It’s not like we didn’t already have a lot of gear. But can you ever have enough? We would have bought the tent of our dreams anyway. For eight years now, we had been looking at the Kaudom tent at Greensports. Now we bought it. Various other accessories such as a fridge/freezer were added. Greensports, our trusted outdoor retailer, made a great Christmas deal with us. Of course, this new equipment made us want to go somewhere else even more. It had to be tested after all! But I was still very weak, and therefore a long journey was out of the question. One evening Anita and I drove around in the Veld behind Cimbebasia. Suddenly there was a beautiful kudu bull in the middle of the road. This encounter immediately triggered the association “Daan Viljoen” for me. 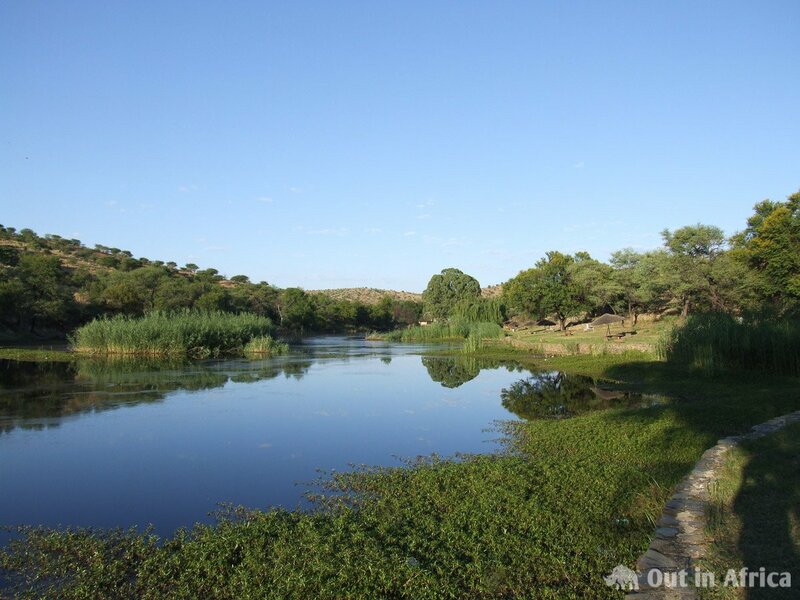 The Daan Viljoen Game Park is located about 20 km west of Windhoek in the Khomas Highlands. During my school days, we went there every holiday for a day. We got up early, and after our arrival, we first went on a game drive, where we always saw oryx, zebras, wildebeests, springboks and kudus. After the game drive, we went to the picnic area at the Augeigas dam. That’s where we spent the rest of the day. We children loved to climb into the deep gorge behind the dam. All these memories came to me when I saw the Kudu in the Veld near Cimbebasia. And then enlightenment hit me! Daan Viljoen could be our spa! There is a campsite there; one could observe animals; it is one of the most famous places in southern Africa for birdwatchers, and it is very close to Windhoek. But was the Daan Viljoen of transfigured childhood memories the Daan Viljoen of the present? “Run down like everything else since independence!” it was said. And: “On weekends it’s a party mile for the Coloureds.” And: “Probably all animals have been poached away, now that Katutura is spreading more and more in this direction!” Anita and I drove out to the park and inspected the campsite. It still looked good. There was green grass. After a round of checks, the sanitary facilities proved to be clean and functioning. There was even electricity at the campsite. And on the way, we met wildebeests and warthogs. We decided to test it for four days. On the website you will find affilate links to online shops. Read more about this here.